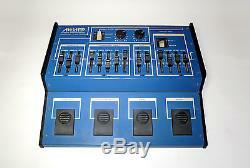 LIDER-1 - RARE SOVIET ANALOG GUITAR MICRO SYNTHESIZER FX PROCESSOR. 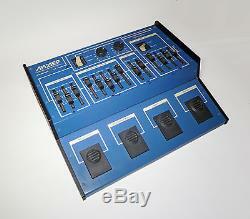 RARE SOVIET ANALOG GUITAR MICRO SYNTHESIZER FX PROCESSOR. IF ANY QUESTIONS DON`T HASITATE TO ASK. 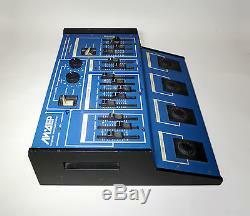 For sale is extremely rare soviet vintage analog guitar synthesizer "LIDER-1". It is a original guitar effects processor produced in 1980`s by Katchkanar radio equipment factory "Formanta", famous for its well-known synthesizers Polivoks, Manual, Maestro etc. 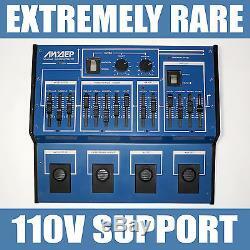 Was designed to be applied by musicians who use external effects in the live performance or studio work. 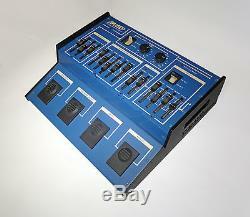 Can be easely used not only with guitars but with synths, organs, bass e.
It is a floor-mounted unit with four rubber footswitches; it also has sliders and knobs for changing the parameters of effects. LIDER-1 has 4 main serial sections: mixer, phaser, Polivoks-type resonance filter, modulator (VCA with ADR) - each with its own parameters and indicators. On the outer surface of the bottom panel, an input sensitivity regulator is situated. The unit is very original & beyond competition not only during 1980s but even now by its idea, quality and of course SOUND which is amazing! A very deep, warm analog set of effects which can be combined in any way producing a diverse palette of "out-of-this-planet" sounds! (check the Demo section below photoes). No matter you are doing indie or core, no matter you are playing guitar or synthesizer... This "monster" will turn you mind upside down. Even more, if you are a Polivoks fan - its Analog resonance filter with auto controlled ADR and modulation is definitely your choise! The mains power of the unit is 220 volts. For 110/127v countries I`ll include voltage converter. The unit is EXTREMELY RARE & is hard to find by all means even in former USSR countries. 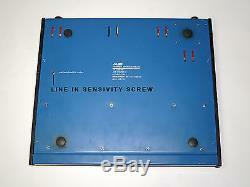 It is fully tested, serviced & is in ideal 100% working condition. DON`T MISS THIS TRULY COLLECTORS ITEM!! MIXER: Clean guitar ammount, octaver fx, suboctaver fx, rocktone drive-distortion fx. MODULATOR (VCA with ADR) : Attack, Sustain, Release. Indicators: Power, Overload, Phaser speed, Effects on\off Rubber pedal controls: mixer, phaser, envelope filter, modulator. 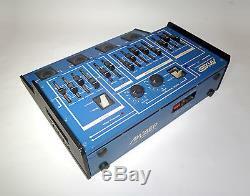 Outputs - (1/4 TRS "Jacks") Amplifier, Phones, Line out Inputs - Audio input Mains voltage - 220V. (For use with 110/127V, I`ll include a voltage converter). Dimensions: - 43 x 36 x 12 cm (61.9x14.2x4.7 in) Weight: - Approx. 7 kg (15.4 lbs). 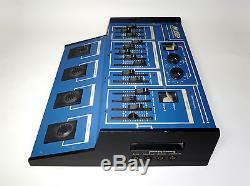 Lider-1 Guitar Synth - Power cord - Schematics & Manual (with English translation) - Front panel translation - Power converter. ALL MY ITEMS ARE POSTED Worldwide (Professionally carefully packaged). 1-3 weeks (usually 10-15 days to USA, 7-10 days to Europe, 18-25 days to Australia). The item "LIDER 1 SOVIET ANALOG GUITAR SYNTHESIZER POLIVOKS FILTER ussr russian gr-300" is in sale since Sunday, November 20, 2016. 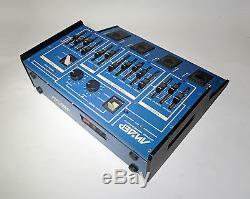 This item is in the category "Musical Instruments & Gear\Guitars & Basses\Parts & Accessories\Effects Pedals\Processors". The seller is "alexstelsi" and is located in Europe. This item can be shipped worldwide.